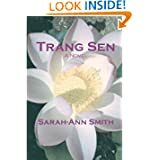 Set in the Vietnam War era, Sarah Ann Smith’s novel “Trang Sen” touches numerous genres—historical novel, coming of age, love story, political analysis—but at heart it is simply a riveting story of fascinating people caught up in the turmoil of their time and place, and told in the spare style of a true master of the language. Trang Sen is “White Lotus,” a young Vietnamese girl caught up in the chaos and heartbreak of civil war, international conflict, and the disintegration of her family. At last, in a new life far from her homeland, she finds deep within herself the brave woman she has always longed to be. TRANG SEN is a phenomenal novel that tells of a young girl discovering herself amidst war and life. The historical detail of the book is rich and flavorful and more powerful is the simple way in which the story is told, without artifice, that gives it a biographical touch. I highly recommend this poignant story to anyone wishing to relieve a historic period through the eyes of a young innocent who was forced to grow up too early, and find her own way through life.